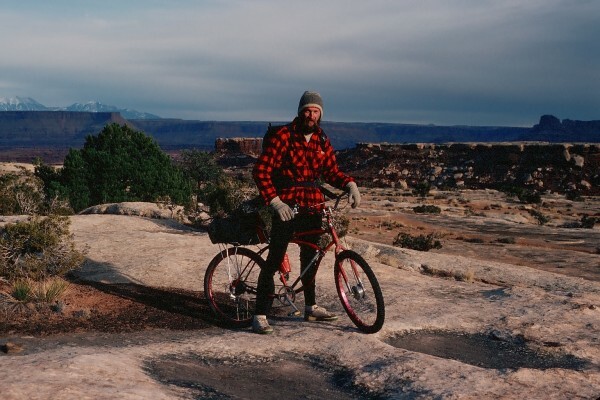 More adventures in Dr. Peabody’s “wayback Machine” wherein our intrepid travelers ride the first mountain bikes on the White Rim Trail. The winter of 1975-1976 was a drought year in central Colorado, with diddly squat for snow pack in the high country. In a normal snowfall year my friend Steve Morgan and I might be found doing multi-day ski tours in the Elk or West Elk Mountains around Crested Butte. If we tried it on this particular winter we would be carrying our skis on our shoulders for many miles, which held no appeal at all. Since we would typically retire to Canyonlands in Utah during spring break in March for a little warmth and sunshine after a cold Gunnison winter, we decided to just move our desert trip up by three months instead. This was during the era in Gunnison of the “roll-your-own” mountain bike, wherein we would get an old single-speed clunker for about tem bucks and build it up with various off-the-shelf components into the first mountain bikes. Commercially available mountain bikes would not be marketed for another couple of years. 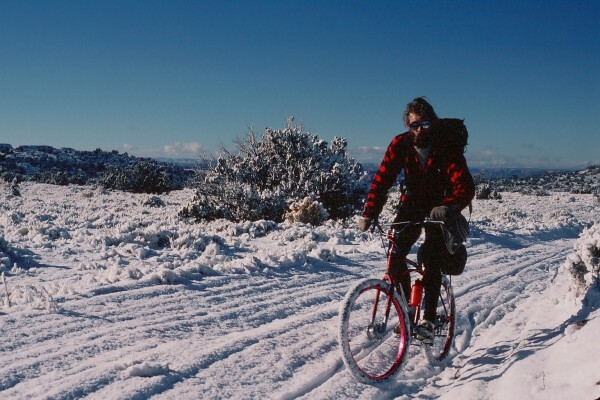 So Steve Morgan and I both had proto mountain bikes that we had built that previous summer, and decided what a cool thing it would be to ride the White Rim Trail in the winter. We arrived early one December morning at the Island-in-the-sky ranger station to announce our intentions (daft), get any beta on water availability (not much), and to indicate that our truck would be in his parking lot for several days, but don’t worry about it. He was cool with it. We didn’t have panniers, just big honkin’ mountain packs crammed with our gear, a couple of liters of water apiece, and about one and a half clues to rub together (you don’t get a lot of heat that way, dontcha know). We descended the Shafer Trail without actually burning our brakes out, got onto the relatively flat White Rim trail, and made pretty good time. We would occasionally find small depressions in the sandstone of the White Rim that held a couple of inches of water, and that comprised our water resources for the first day. It has always amazed me how much suffering a young lad can take and still convince himself that this is all great, grand fun. That first night was spent camping on the White Rim on the Colorado River side of Island-in-the-sky. It was a dry camp, using just the bottled water we brought, but there was enough for dinner and the following morning’s breakfast. 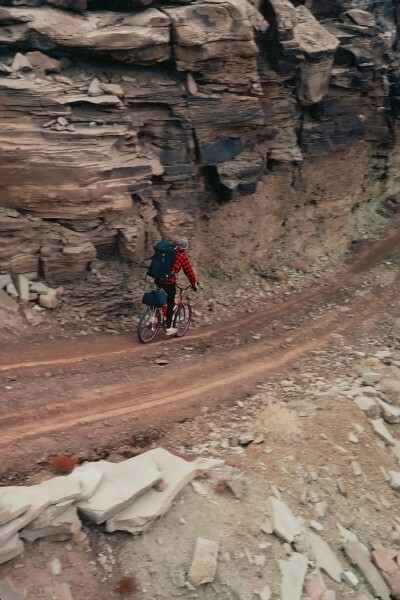 Steve Morgan descending the Shafer Trail in Candylands on his homemade mountain bike. 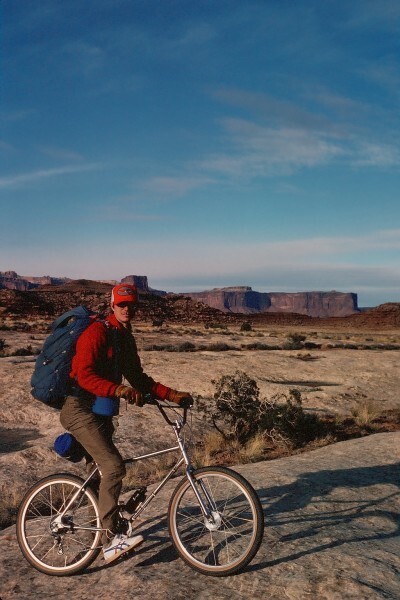 Steve tooling along the White Rim Trail about a mile from where it intersects the Shafer trail coming down from Island-in-the-sky. La Sal Mtns in background. Steve and his bike on the Permian White Rim Sandstone Formation. Not all potholes contained water, but enough did to sustain us on our first day of riding. Toward evening on the first day, with temps in the low 30’, and getting into the hi teens that night. The days were cool, the nights were cold, but the weather stayed clear for the first three days. 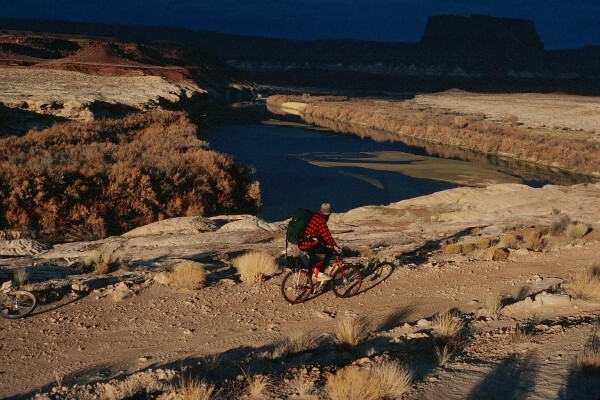 On the second day we rode around the southern end of the White Rim and into the Green River side of Island-in-the-sky. 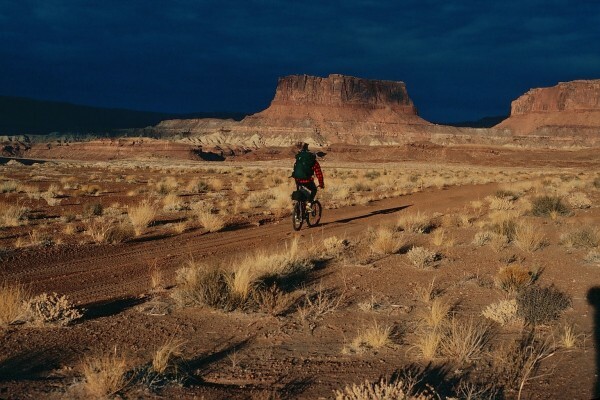 For the most part the White Rim trail was hard-packed dirt or bare sandstone and we were able to ride many miles with relative ease. Occasionally we would hit energy-sapping soft sand, but these stretches seldom lasted more than a few hundred yards. Steve stunting for the cameraman. Notice the safety head gear – we’re all about safety. Yer loyal scribe on the southern part of the White Rim. Style points for the Haliburton hat. About the bikes: Steve’s bike is a Schwinn “paper bike” frame with custom aluminum rims laced to hub brakes from a moped. He has the usual rear derailleur and 5-gear rear cluster off a road bike in back, and the original single piece cast steel crank and single chain ring in front. I have one of the very first custom frames with a three piece aluminum crank, and aluminum rims laced to the same moped hub brakes. Both Steve and I have motocross handlebars, grips, and brake levers. Steve has the only bike pump on our little expedition, which we thankfully did not need. Steve and “Nick Danger” on the edge of the abyss. On the second day we camped on the White Rim Sandstone where it was near the Green River. We were able to find a chimney crack system down through the sandstone ledge that gave us access to the Green River, which was good because we were out of water. For that night and the following morning we filtered the sand out of the water through a bandana and boiled the water before filling our water bottles. The second day and night were the warmest of the trip, with daytime temps in the 40’s and night time temps in the 20’s. Steve cruising along the White Rim trail late on the second day. Steve on the White Rim trail very near where we camped on the second day, as the Green River was near enough to give us water. On the third day we road into Mineral Bottom and the end of the White Rim trail. This was our shortest day, but the weather was looking unsettled so we looked around for some convenient sandstone ledges to sleep under as we had not brought a tent. We were able to get water out of the Green River again, filter and boil it, and prepare our evening meal before it started to rain. Although it rained pretty much the whole night, we were snug in our bivy sacks underneath the rock ledges, and didn’t climb out of our bags the following morning until the weather was clear. Up to this time, the bike riding had been smooth sailing on easy roads with stunning views. That scenario did an abrupt about face on the last day. Much of the Mineral Bottom road is a consistently steep jeep road on a clay substrate that gains almost 2,000 ft of elevation in just a few miles. With the previous evening rain it had the consistency of gorilla snot, and pushing our bikes up that road was like trying to climb up King Kongs’ nostrils during hay fever season. An then we got high enough where the previous evenings precipitation had turned to snow. At first we thought the frozen conditions would be better because the clay would not stick to the tires. The snow stuck instead, and was actually worse. Once on top we had to ride in 4 – 5 inches of snow on a sandy road for about 15 miles back to the Island-in-the-sky range station. It was standing on the pedals in first gear the entire way back. Without a doubt, that last day was the longest bike ride I have ever done, including double century’s I would do later in life. You are officially declared the winner of Supertopo for the day ! OMG! I've done the White Rim on several occasions with my high tech modern MTB..convinced that in some places it isn't even up to the task. This is absolutely incredible and so much fun to get this blast from the past. It's an adventure now, but you made it so much more! NICE! Thanks for the old skool rundown. Badass effort and entertaining report – TFPU. Looking forward [heh] to more back issues. Very cool and a proud effort. Awesome old-school adventure! Having seen how bad that mud can get, I can't believe you made it out of the canyon with 40 lbs. of Schwinn. So that's how it started! Very, very cool! Adventure all the way! Very nice! You guys were definitely the pioneers! I did that ride on a very cool day on a bike not that much different than yours! Loads of fun, though I can't imagine climbing out of Mineral Bottom in 5 inches of snow!!!! OK. You reset my MTB timeline a couple of years earlier. Thank you for sharing your early & significant MTB "sufferfest." 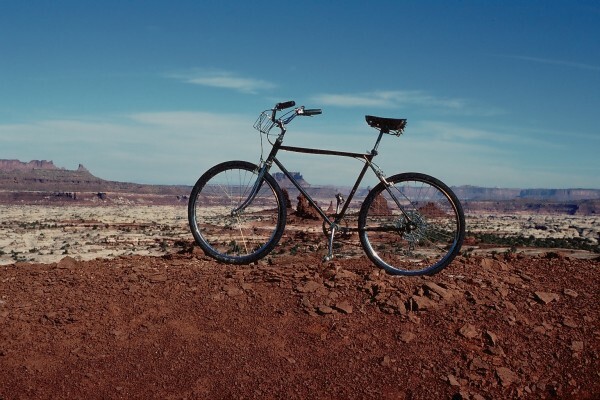 To all of you paleo Mt Bike fans, this is a photo of the very first mt bike, as far as I know. "The Mayfield", the first mtn bike. My friend Jim Mayfield built this in the spring of 1974. Jim worked as a bike mechanic at "The Tuneup" bike shop in Gunnison and put this together on a whim. He had seen a bunch of us jumping off ledges and riding down stairs on single speed paper bikes all around WSC campus, and thought that with this upgrade we could ride up the stars as well. The following year the folks at a bike shop in Crested Butte started butting sheet metal screws in knobby bike tires and making bikes that could be ridden around on the snow-packed streets of "the Butte". I understand that sometime during the mid-70's folks out in California started putting wide rims and fat tires on single speed paper bikes, with the burliest caliper brakes they could find, and using those for making fast down-hill descents, but those bikes, as well as the bikes in Crested Butte were still single speed bikes. Mayfield's bike was the first multi-speed mtn bike. Jim lent me his bikwe for a few days of tooling around on dirt roads and trails in the West Elks, and then I wanted one. 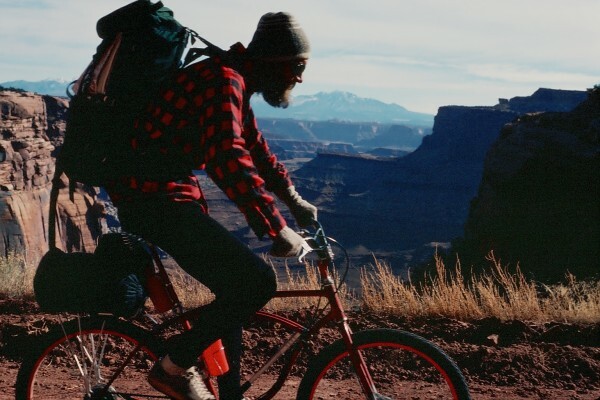 That was how the "roll-your-own" mtn bike craze started in Gunnison in 1975. BTW, many thanks for all of the positive posts on this TR, you are definitely bringing a smile to this old poop's face. Great adventure that must have been. Thanks for posting! Bob, what a great TR! You guys were pushing the envelope, as usual. Classic in so many ways. Thanks for sharing this. "Like the hot kiss at the end of a wet fist"
I'll have to see what slides I still have of that Crestone climb with John Rosholt. I pick up another batch of slides converted to digits this afternoon that recounts many of my adventures with John Ferguson, plus I have more digital images of the first mtn bike ride into the Maze - will post that one next week. Surely you have some pics of San Juan Mtns adventures, or climbs in the Elk Mtns??? amazing story and pictures. it is fun to contrast this with the current trend in "adventure cycling" that has taken over the cycling world. what goes around comes around. thanks for sharing, can't wait for the story on the maze! 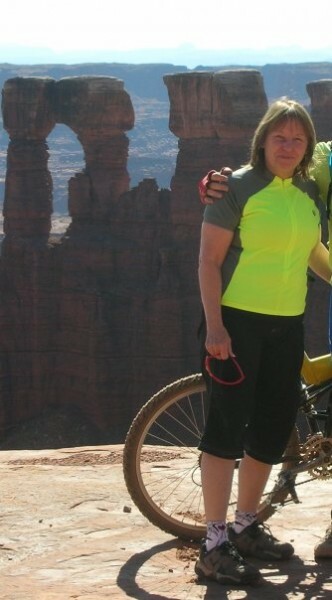 A few years back on the White Rim. You TR has me thinking about it again. Maybe (definitely) before the snow hits! I keep re reading your report! Proof that suspension, space-aged materials, and lycra are way overrated. ^^^^^. Unless you're over 55!!!!!! Wow, nice bike there Susan! Ha ha Jay...guess you should now that one well! I didn't get rolling until the 1980's but I've always been under the impression that Mtn biking got started on Mt. Tam in the early 1970's. Nice, Mr. Danger. Some of those photos are treasures. that was great--bandannas are always cooler than helmets!! Bandanas rock, especially when used as a filter to clean your water! Bob, unfortunately, I had my whole slide collection stored in the cellar of the old Victorian house I lived in in WheatRidge. It was really damp down there and I lost about 95% of my whole collection. Ugh! Great stuff...I didn't get my first mountain bike until '83. You are correcting thinking that early Mtn bike development occurred in the early '70's in the Mt Tamapai area (or Mt Camel Pie, as we disrespectfully referred to it). I think that was in 1973 when california crazoids were taking the same old Schwinn paper bikes and building them up with robust rims and brakes for fast descents down the single track trails of that ares. They may even have been the first folks to lace those stronger rims to moped hub brakes, since we borrowed that idea for the bikes we built. The Mt Tamalpai descenders were single speed bikes though. Jim Mayfield was the first to put a rear deraileur and 5 speed hub to the first mtn bike he built. Since the California folks had a one or two year jump on us, there were things like wide aluminum rims and robust stems on the market as aftermarket parts that we used to home brew our first mtn bikes in Gunnison. I have always missed the Yamaha dirtbike handlebars , grips, and hand levers from my first home brewed mtn bike, as those items just felt right to me. Bummer that it got stolen from me in the late '80's. Susan, nice image of Mussulman Arch in the background of your photo. Thanks for posting that pic. I hope you make it back to theWhite Rim soon. Map of France with the route of the 1910 Tour de France on it, showing that the race started in Paris, went clockwise through France and ended in Paris after fourteen stages. The 1910 Tour de France was the eighth edition of the Tour de France, taking place 3 to 31 July. It consisted of 15 stages over 4,734 kilometres (2,942 mi), ridden at an average speed of 28.680 km/h. It was the first Tour to enter the Pyrenees mountains. Two main candidates for the victory were 1909 winner François Faber, a sprinter, and Octave Lapize, a climber, both members of the powerful Alcyon team. Because of the points system, their chances for the overall victory were approximately equal. The race was not decided until the final stage, after which Lapize had won by a difference of only four points. . . . . The courses of the Tour de France in 1907, 1908 and 1909 had been nearly identical. but later gave in and sent Steinès to the Pyrenees to see if it was possible to send cyclists up the mountains. Steinès encountered many difficulties. He went there at 27 January 1910, and asked an innkeeper for directions over the Tourmalet. The innkeeper replied that it is barely crossable in July, so practically impossible in January. Steinès hired a car anyway and rode up the mountain. Close to the top, there was so much snow that the car could not go further, and he continued on foot. Steinès walked during the night, and fell down a ravine. At 3 a.m. he was found by a search party. He quickly got some food and a hot bath. The next morning, he sent a positive telegram to Desgrange: "Have crossed the Tourmalet on foot STOP Road passable to vehicles STOP No snow STOP". When it was announced that the Pyrenees were included in the race, 136 cyclists had entered the race. After the news, 26 cyclists removed themselves from the starting list. Other newspapers reacted to the Tour's route as "dangerous" and "bizarre". By 1870, cyclists were fed up with the lumbering bone-shaker design popularized by Michaux, and manufacturers responded by enlarging the front wheel of the vehicle to massive proportions to ensure a smoother, faster ride. At first, bicycles were a relatively expensive hobby, but mass production made the bicycle a practical investment for the working man, who could then ride to his job and back home. Women, too, started riding in great numbers, which required a dramatic changes in ladies' fashion. Bustles and corsets were out; bloomers were in, as they gave a woman more mobility while allowing her to keep her legs covered with long skirts.